We hear it all the time, from the founder of the tiniest operation to the CEO of the largest Fortune 500 company: “our most important thing is our people.” I have no doubt that for many of these companies this is the absolute truth. But, unfortunately, most don’t recruit like it. See, the problem with startups is that almost all of them have more work to do than they have resources to do it. Goodness knows I feel that pain. We’re a tiny operation with dreams so big we could keep our staff busy if it were ten times the size it is today. And recruiting–if done really well–is every bit a full time job. So we all compromise. We put it on the backburner until we’re absolutely desperate to hire. We spend more money than we should–on job boards and headhunters and developer auctions and all the other promised quick fixes–because in many cases it’s the only choice we have when we’re against the wall. It’s not so much that our time is more valuable than our money. It’s just that there are 24 hours in a day and all of them are already accounted for. But hiring the right team is super damn extra special important. And the smaller you are, the more important it is. A single employee can make or break a small company, and can have a significant impact on larger ones. Your people truly are your company. There are no instructions for the next guy to pick up where the last guy left off. No, the brilliance and creativity and craft a great employee puts into his code or design cannot be duplicated. In a very real way, he is a part of the product itself. For a while now we’ve been advocating a proactive approach to recruiting that we call The Work for Pie Way. In a nutshell, it’s the process of identifying, engaging, and building relationships with potential candidates year round, whether you’re hiring or not, so that when it’s time to hire you already have a “virtual bench” of interested candidates from which to choose. It’s treating recruiting and hiring as a relationship rather than a transaction. 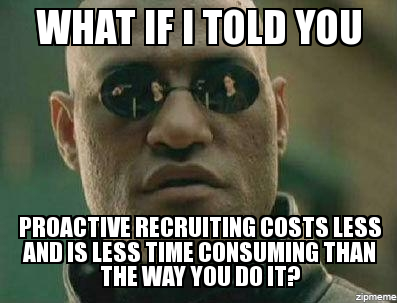 There’s only one problem: most companies just don’t have the time or resources to build and manage a proactive recruiting strategy. We hear you. So today we’re happy to announce the launch of Pieworks. The concept of Pieworks is simple: give us four weeks, and we’ll build or re-build your recruiting process from the ground up, with a focus on proactive recruiting and relationship building. We’ll help you increase exposure and interest, and we’ll help you initiate and maintain communication with potential candidates. And we’ll help you do all of these things in a way that’s genuine. Then, once we’re finished building, we’ll manage some or all of the new process for you. Pieworks is *not* a headhunting service. Headhunters sell you fish (and are just as happy to sell the same fish to the next guy who comes along for the right price). Their incentive is volume, so many of them do whatever they can to get someone placed, regardless of true “fit.” We’ll teach you how to fish, and then we’ll sit alongside you in the boat. Our incentive is to help our clients build great teams, and our pricing structure reflects this. So, if you’re a great company with a great team, but you struggle with recruiting because you don’t have the time to give it your full attention, we would like to help. We’re only working with four companies per month to start. If you’re interested in learning more and want to add your company to the waiting list, you can sign up right here. P.S. The launch of Pieworks in no way means that we’ll be changing our plans with Work for Pie. In fact, it’s quite the contrary. A Work for Pie Company Page is one of the tools we recommend to every Pieworks client. We truly believe that Work for Pie will become the primary place tech folks come to learn and connect. We can’t wait to show you what’s next.